This question is at once lofty and ordinary, addressing one of the most pressing sustainability challenges of our times and one of the most routine. How to get to and from home to work, school or market is simple enough, but to do it reliably, affordably, and sustainably for billions of people is a challenge society has not yet solved. 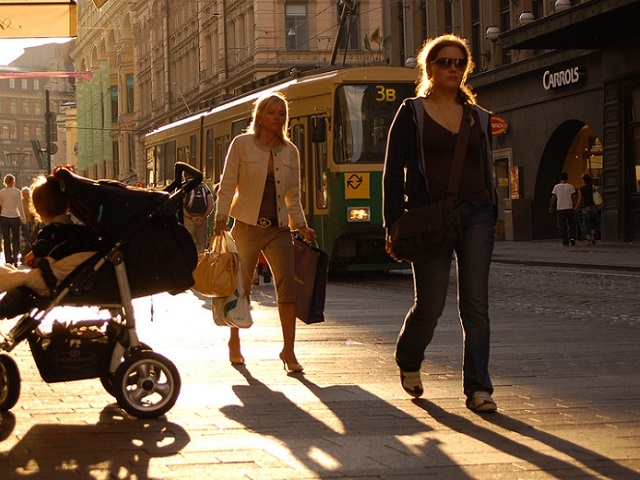 Much has been done already to place urban development on a more sustainable path. But, urbanization is picking up steam, with cities expected to add 1.4 billion people in the next 20 years. Global ambition to take action is also on the rise. The need and the demand for solutions are outpacing what’s currently on offer. It is time to try something different. Human-centered design thinking is one promising approach. It integrates the needs of people, the creative application of resources, and the requirements for business success. EMBARQ – the producer of TheCityFix – is taking a look at how this approach can be applied to transform urban mobility. Over the next few months, TheCityFix will take you along for the journey. 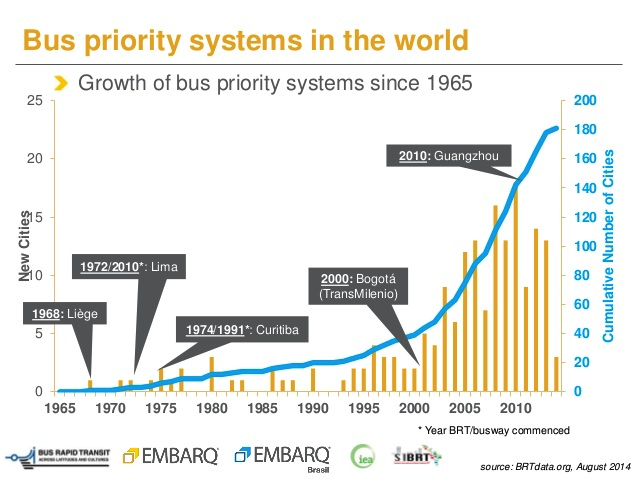 Bus rapid transit (BRT) has spread to 186 cities, serving nearly 32 million people each day. Much of that growth has occurred in the last decade. Campaigns to inspire action are more approachable, like the European Commission’s “Do the Right Mix” (see the video) or the Designed to Move initiative. The impact of these solutions is undeniable. While there is no single measure that sums up the global benefits of these advances, EMBARQ’s own impact helping cities realize the benefits of sustainable mobility tells part of the story. Today, over half of the world’s population lives in cities. By 2050, however, the world’s population is estimated to grow to 9.6 billion, with 66% living in cities. This rapid growth means we need to do more, faster. Fortunately, world leaders are aligning to help. For the first time, cities are a focus area in the United Nations’ Sustainable Development Goals (SDGs). City leaders played a key role at the recent U.N. Climate Summit in New York City. Networks and alliances abound to address cities’ needs for financing infrastructure, knowledge sharing, common action agendas, and transformative technology. We can either wait for change to happen, or we can create change by design. But how do we find the “next BRT” or the “next car-share?” The key is asking the right question to the right group of people. That is the essence of human-centered design. For years, businesses have used design to create new products, markets and services – from the computer mouse to mobile banking in rural Africa. It starts with a deep and empathic understanding of user needs and experience, synthesizing the discovery to ideate, prototyping and field-testing early, and then implementing. Take the example of U.S. passenger train service Amtrak. Amtrak wanted to improve the passenger experience on its busy Acela route between Washington, D.C. and New York City. It began looking at the train itself, but its breakthrough was realizing the passenger experience actually began much earlier. Out of the ten steps of a passenger’s journey, eight happened before they even got on the train. Human-centered design was the key to identifying opportunities to improve the overall experience. Another important aspect of the design approach is failing early. That means moving ideas from paper to the real world as quickly as possible so that learning can occur as quickly. For instance, it was not in a research and development lab but with a plastic toy shell, guitar wire, wheels from a toy train set, a jam jar lid, and some wax that gave birth to the computer mouse. This approach has also been applied successfully to social innovation. When the Japanese government wanted to get citizens to help reach the greenhouse gas emissions targets set by the Kyoto Protocol, instead of mandating change or flashy advertisement, they hired Hakuhodo, a design firm. They spotted an area for improvement – the temperature in office buildings. The question became how might they convince offices to change thermostat settings when, typically, the temperature was set cool enough to be comfortable for men to wear suits. Their answer was the “Cool Biz” campaign, which made it culturally acceptable for office workers to wear casual attire to stay cool in the summer. The result: 25,000 businesses signed on voluntarily, lowered energy use, and reduced greenhouse gas emissions. What can human-centered design thinking do for sustainable transport? EMBARQ is looking to put human-centered design into action for sustainable transport, and began working with design firm IDEO earlier this month. Over eight weeks, a team of experts from both IDEO and EMBARQ will conduct field research in Helsinki and Mexico City, then move to San Francisco for a design workshop with “first movers” – people with experience and passion for pioneering ideas, including philanthropists, venture capitalists, bankers, technology experts, telecomm providers, marketers and, yes, even automakers. IDEO will then go solo to ideate in peace. This journey will not end, but lead to a new beginning with a set of designs and prototypes to bring to the world. More than just following this process with us at TheCityFix, we hope you’ll participate! Leave a comment below to fill us in on cool ideas you’ve seen, heard of, or done yourself that applied human-centered design to solve an interesting question. Acknowledgements: The EMBARQ project with IDEO is underwritten by Mr. Carlos Rodriguez Pastor and the William and Flora Hewlett Foundation, with additional support from General Motors and TransitCenter. The San Francisco design workshop is co-organized in partnership with the Global Philanthropy Forum and Northern California Grantmakers Association.